Ambassador Jaliya Wickramasuriya briefs members of the Washington Intergovernmental Professional Group on reconciliation, development and economic opportunities in Sri Lanka during a reception at the Sri Lankan residence, Washington, D.C. Ambassador Jaliya Wickramasuriya discusses Sri Lanka with two members of the Washington Intergovernmental Professional Group during a March 10 reception. 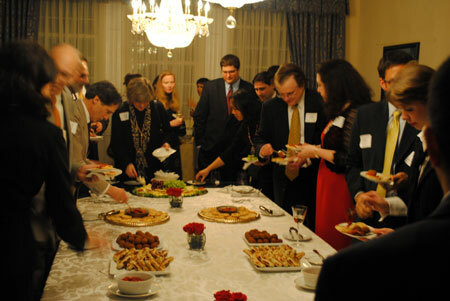 Washington Intergovernmental Professional Group members enjoy Sri Lankan food at a reception at the Sri Lankan residence. A group of Washington professionals met with Ambassador Jaliya Wickramasuriya at a March 10 reception to gain a better understanding of current developments in Sri Lanka. The Washington Intergovernmental Professional Group, whose members meet with embassies and U.S. government officials, joined the ambassador to discuss Sri Lanka’s economy, trade opportunities and relations with the U.S. Ambassador Wickramasuriya, in opening remarks, briefed the group on Sri Lanka’s economic growth, tourism and reconciliation. The Washington Intergovernmental Professional Group is comprised of attorneys, consultants and former and present government officials who work with the U.S. government and American companies on overseas missions. Some of those attending the Sri Lankan reception had just returned from Sri Lanka, while others had traveled there previously. Nelson Garcia, chairman of the Washington Intergovernmental group and a former Congressional staff member who now works in the private sector on transportation issues, noted Sri Lanka’s dramatic development since the successful end of its long conflict against terrorism in May 2009. Members of the group showed a particular interest in tourism, and how Sri Lanka is positioning itself for the expected growth in the number of foreign visitors. The ambassador discussed plans to increase hotel capacity and Sri Lanka’s work to increase the efficiency of its infrastructure, including airports, railways, highways and ports.